Our raw fir tree honey comes from Mesolonghi in Western Greece and our bees source the honey from the fir trees that grow here; these trees grow high up in a mountainous region at an altitude of 1000-1300m (3500 – 4500 ft..) which due to its location makes it an untouched and uncultivated area. This means that the land here is free from pesticides and fertilizers unlike other honey which is derived from areas where farmers spray their crops with chemicals nearby hence affecting the quality of the honey. 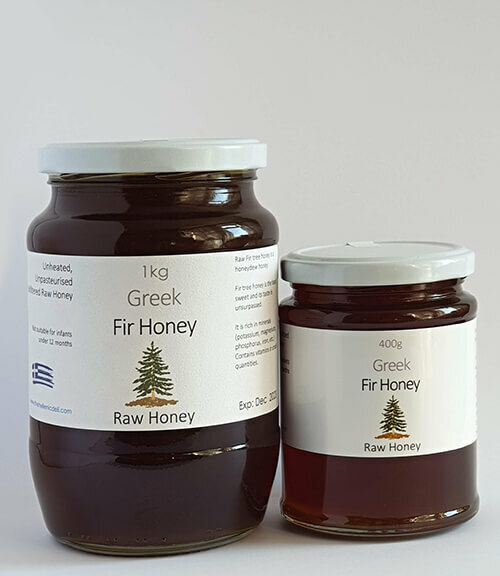 Raw fir tree honey and honeycomb are very rare to find and for this reason it is also the most expensive honey on the Greek market. Although not officially certified, our honey is Organic. Official Organic Certification is financially unrealistic for an Independent Bee Keeper like ours. instead he cares for his bees by using organic hops, a natural key ingredient in beer production, to reduce parasitic mite populations in honey colonies and this makes our honey organic although not certified. You can be confident that all our honey is unheated, unfiltered, unpasteurized and we guarantee that it is a pure and nutritious raw honey. The honey is packaged directly from the honeycomb and has a distinct amber colour. Fir tree honey is the least sweet and its taste is unsurpassed. © 2019 The Hellenic Deli, all rights reserved worldwide.